I’ve always felt that, as a designer, it’s my job to encourage you to try new things. And that includes encouraging you to try clothing shapes and silhouettes that you might not otherwise consider for yourself. I mentioned this in my Ask Me post last week, and I’ll address it more in the months to come. I admire you trying to get us less than ideal shaped women into other silhouettes. However, all the pictures you show are, of course, of women with the “traditional” model shape. I know it is hard to find inspiration photos where the models are “normal”. It would be helpful and encouraging to see this on women who weren’t ultra slim. I would be more encouraged to see photos of your pattern on women who aren’t model thin, so I can better envision the possibility for myself. So fun! 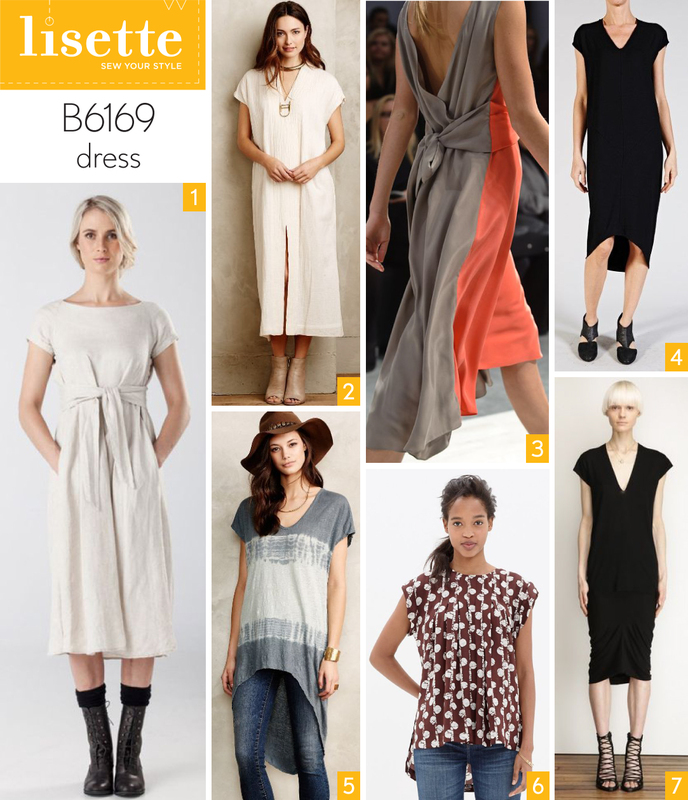 I love the inspiration photos for this dress, especially the color blocked version. Thanks for getting my creative juices flowing with this pattern! I want to believe you Liesl but I am not sure. I am not one of those curvy ladies who wears 50’s style dresses however I am not convinced these drapey styles would do me any favors. Maybe I can see both #1’s working because the first has a fuller skirt for balance and the second a deep-V neckline with a wider cinched waist. 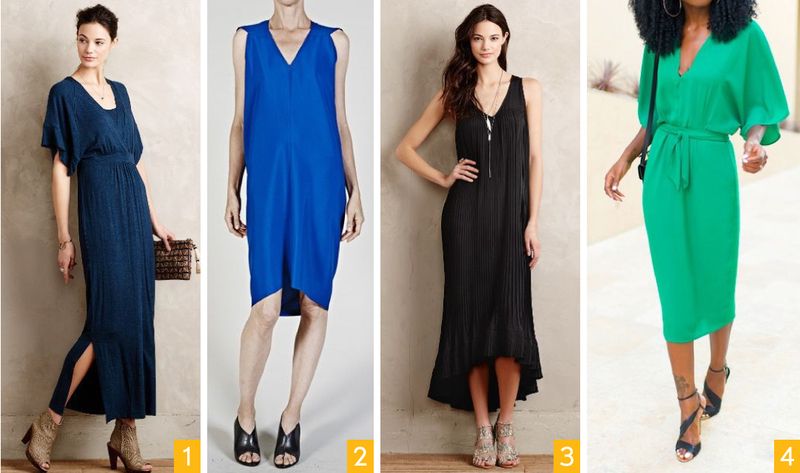 I adore how the first #4 and the second #2 look on the models but fear they would simply be sacks on me. I would love to see photos of real women of average height with curvy busts, stomachs, and hips wearing this new style because I appreciate the fashion and versatility of the design! I also agree that many of your new patterns for women have not appealed to me because I am short and curvy/full-figured (5’2″ size 18). I am not convinced that any of these shapes will work for me and really need to see them on a real person with a figure similar to mine. I think if you had the women at the Curvy Sewing Collective sew up some of your designs and review them on their blog that might help! love it! How would you suggest wearing/altering/styling for the nursing mom? This dress is my favorite of the new patterns! That is, at least until you show us something else! (easily distracted by shiny objects) Thanks for showing versions that aren’t hi-lo. Thanks for yet another interesting post Liesl. I have to admit I bought the other three patterns and not this. I don’t live in the 50s style silhouette you mention, but I do wear it a lot, as I like it and it is flattering for my pearish figure. I’m 5’6 and have quite good shoulders, but not enough to balance my hips pleasingly to my eye, so I tend to like a defined or semi defined waist. I do in fact wear dresses that are not at all defined in the waist, but they tend to be either sleeveless, fitted through the bust and a line, or a Japanese pattern with box pleats from a fitted bust – both styles are fabulous in a not too drapey but light linen in summer heat! Now that I’m seeing real pics of dresses similar to this dress worn with sashes, I am more tempted by it – I was put off by the combo of drapey, not very waisted and narrowish – I’ve tried stuff like that and found it clung to the bulges and made me look like a shapeless pear, which I am not. The Cornejo dresses are gorgeous but not for me – for an apple type they’d be stupendous, I think. I made this dress up (view c) in rayon challis earlier this week. I am a larger size (18-20), and my husband said “Va Va Voom!” It feels so great to wear. Slinky, not sack-like. As Randy Newman sings, “Short people ain’t got no reason to live.” That’s the way the fashion industry makes me feel. I’m not sure how this dress would look on a short person such as me. I’d love to see an example on a short model, 5’2″ or under. I completely love the options you laid out; it really helps think about how I’d style it. I’m game to give it a go! It seems like a variety of silhouettes are included! Maybe you will find some helpful examples therein. I can’t wait to hear what you are working on! Sorry, I’m not buying it either. You say you’re trying to show something different but you still put a stick thin model and a drawing of a Barbie on your pattern. I cannot picture this looking at all good on me. I bought the everyday skirt pattern because I loved the look of it, but I gave away the skirt I made because it doesn’t fit me at all and I’m sorry j wasted my time and money. I have a waist AND hips and I either could not put the skirt on or it was not right on my waist. I just bought the cappuccino dress, but only because I saw some pictures elsewhere online. I don’t know, your cover photography doesn’t help me at all. So far I like the dress I’ve made from that although I’m not completely sure it doesn’t become a tent. Jury is out until it is warm enough around here to actually wear it. i would really like to try the cinema dress but I’m afraid that it would just make me look huge, especially if I don’t find the perfect, soft fabric. Bottom line I love your kids patterns and I really WANT to like your women’s pattsrns. I LOVE that your dresses have pockets. But I just don’t feel like they work for my body. Which is fine, you don’t have to make them. But then when you say that you think you are …. I am really looking forward to making both pieces in this pattern! I just picked up all 4 of the new patterns at Joann’s. Thanks for all the styling ideas, I am kind of dragging my feet because I’m not sure of what fabric to use. I was looking at some stretch rayon jersey knit, but I don’t have a lot of experience sewing with knits. This is my favourite pattern from the new Lisette collection, and am anxiously awaiting both the pattern and the fabric I have ordered to make it with. Not so long ago, I never would have thought to make a dress like this – I’m big busted & short waisted and preferred fitted tops. But over the last 12 months or so, I have been making more and more ‘sack’ like dresses, and I am loving both the look and the fit (serious comfort factor). You had me at Kimono sleeves….. I bet you do look va va va voom! The “Va Va Voom” Robin is not me. But I would like to see it too. It’s exciting to see items that people have sewn and are proud of. I think I will try this dress out too, but will wait for Robin! I can see it happening on this “where did my waist go” very tall chunky figure of mine. I think with careful fabric selection it just may work and I won’t look like I am impersonating a tent. I love the style so I am very willing to give this a go. I especially love the tunic/ top inspiration. It may be easier to accomplish this in the sewing room due to baby demands and I can still wear it while nursing! Its a win win all round. Well, there’s never going to be anything that pleases everyone. Give out free ice cream and somebody’s sure to find dairy products aren’t suitable for their diet. I’m as pear as they come and of ‘un certain age’ as they used to say (also of ‘un certain poid’ if you’ll excuse my middle school French) and I actually prefer a less defined waist. I just don’t like the feeling of anything touching my ribs, and anything that sits at my natural waist is for sure going to ride up to my ribs when I sit. I know Liesl posted a while back about whether we’ve forgotten where our natural waists are and I think I’m guilty of that. Then too, I live in a pretty warm climate and skimming silhouettes are really practical for me. Different strokes for different folks, i suppose. I love the idea of trying a new shape and style…I’ve already got some of the absolutely amazing new Cotton + Steel rayon set aside to make this dress. I think it will make a flattering and absurdly comfortable summer dress! this vein. I practically lived in a dress with a similar silhouette last summer and have been wanting to reproduce it. I find the combination of the sash and a nice, fluid, drapy fabric to be pretty flattering on many body types. Personally, I’ve found the biggest factors that make this silhouette flattering or not on a curvier figure to be a good fit around the shoulders and choosing appropriate fabric. This is so pretty, Liesl. My favorite looks from the first collage above are 1, 2, and 6. I am short and – um – padded, and I think this would be perfect on me. I’ve found that looser clothes are far more slimming than fitted ones. LOVE. LOVE. LOVE. I can’t wait to make this! I am guilty of wearing 50s inspired dresses but I tried the Cinema Dress and was surprised that it was not at all tent-like on my size 16, 5’3″ frame. There are pictures on Flickr to prove it. I do want to see VaVaVoom Robin on the Flickr Lisette page to convince me to make this Butterick pattern. this is my favorite of the new patterns! totally agree that this silhouette is more flattering for my figure. i think it could be cute in nani iro or liberty too- i think i’d make it with a straight hem hitting above the knee. so breezy and comfy for summer! thank you for this! I’m wondering if a lightweight linen would work well?